Most precious metals futures posted gains Tuesday. Gold was an exception, sliding slightly as the U.S. dollar climbed against other world currencies. Gold for June delivery slipped $1.20, or less than 0.1%, to settle at $1,349.50 an ounce on the Comex division of the New York Mercantile Exchange. Gold was held back Tuesday "first and foremost because of a dollar recovery, and secondly because of the equity market rally, which has reduced the appeal of safe-haven assets," MarketWatch quoted Fawad Razaqzada, technical analyst at Forex.com. "However, with the Syrian and Russian situations lurking in the background, the dips remain shallow — for now, anyway." Gold futures traded between $1,340.20 and $1,352.20. On Monday, they rose 0.2%. Advancing for the eighth time in nine sessions, silver for May delivery gained 11 cents, or 0.7%, to settle at $16.787 an ounce. 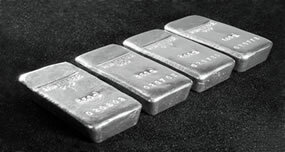 Silver futures ranged from $16.57 to $16.80. They edged up 0.1% on Monday. July platinum moved up $8.20, or 0.9%, to $940 an ounce, trading between $925 and $940.50. Palladium for June delivery added $1.25, or 0.1%, to $1,005 an ounce, ranging from $975.20 to $1,007.30. Well, palladium has certainly taken off like a rocket and left platinum in its contrails! I for one did not expect that after palladium’s recent performance, i.e., pricing weakness of late; who knew? What caused silver to go over the $16.99 barrier today!? (Wednesday, April 18) . At this moment it is up 44-cents at $17.20. *i still say *platinum will be higher than all! But only they-know when. p.s, does anyone know who *they are? *smile.